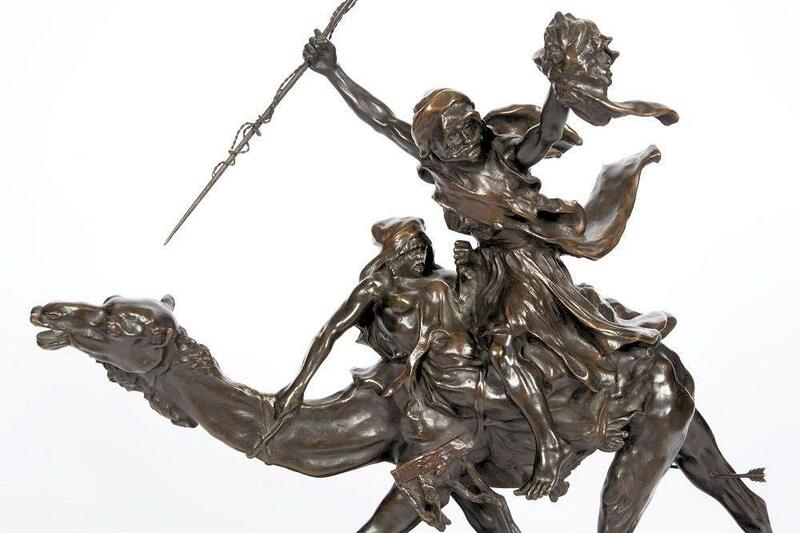 This large bronze group sculpture after Jean-Baptiste Belloc (1863-1919), entitled Méhariste Triomphant (Triumphant Camel Cavalryman) and also known as La Fantasia (The Fantasy), it depicts a victorious soldier on camel holding the head of his opponent saddled with a scantilly clad maiden he's rescued (or kidnapped?). 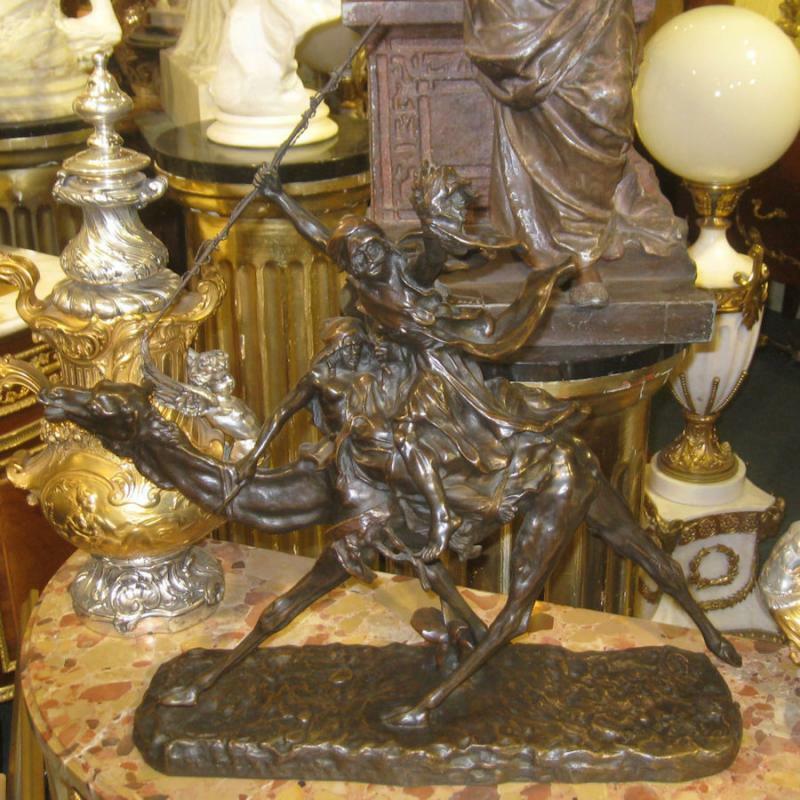 Finely molded, cast and patinated by the Cottin foundry and marked with their medallion, R.Cottin Bronzes á Paris'. Measures 22 1/4 by 22 1/2 inches. 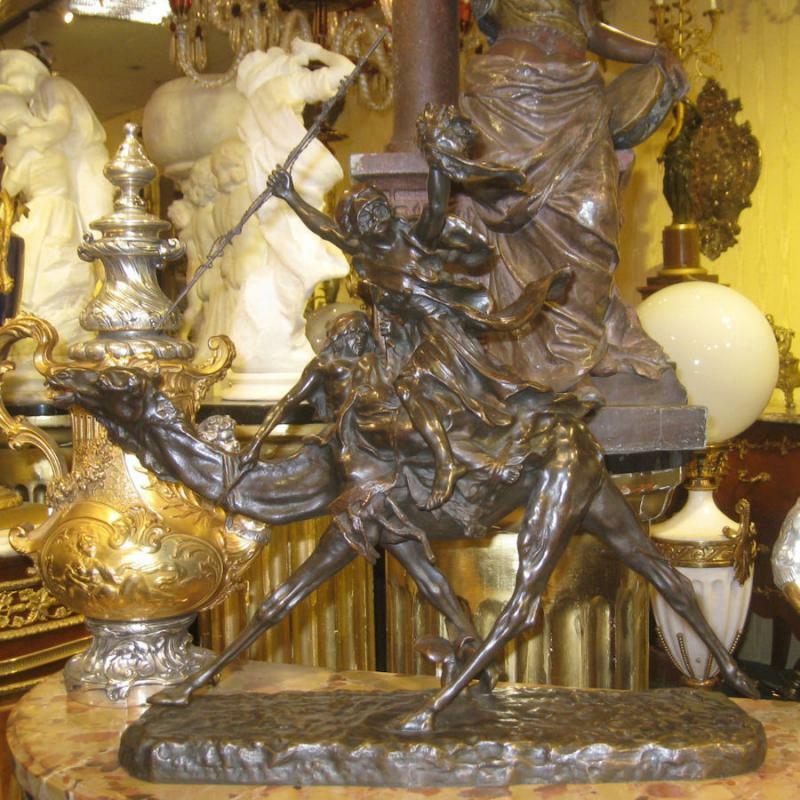 Belloc studied under Antonin Mercie and Emile Thomas at l'Ecole des Beaux-art de Paris beginning in 1882. He debuted at the Paris Salon (Salon des Artistes Francais) in 1889 and in 1890 won the second Grand Prix for a work entitled L’Âge d’or en tant qu'élève (The Golden Age). 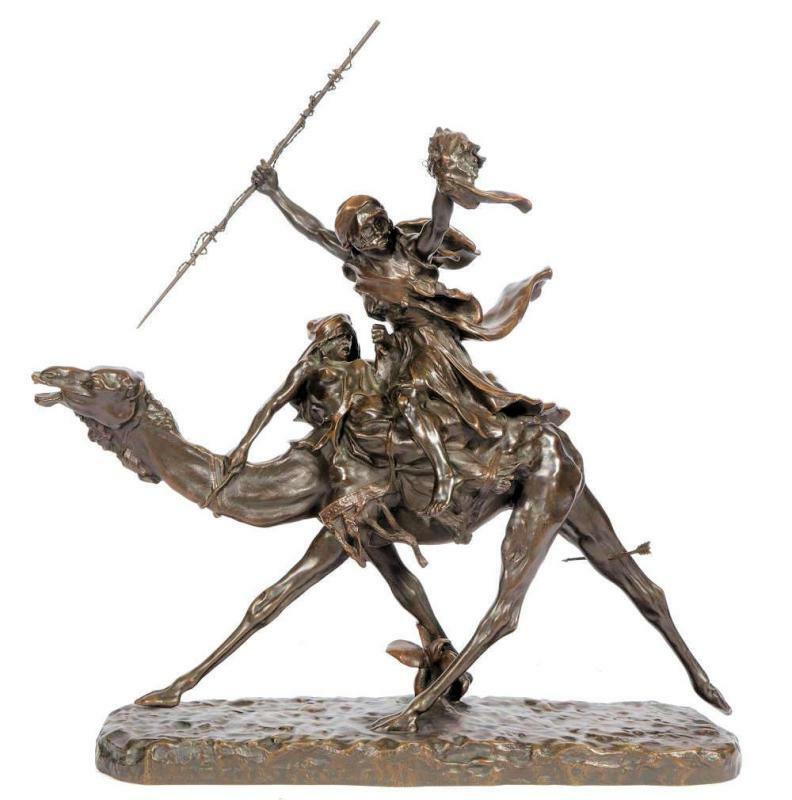 Beginning in 1897 he made several trips to Tunisia and Algeria, becoming a sculptor of the Ministry of the Colonies and a major contributor to the Orientalist movement. 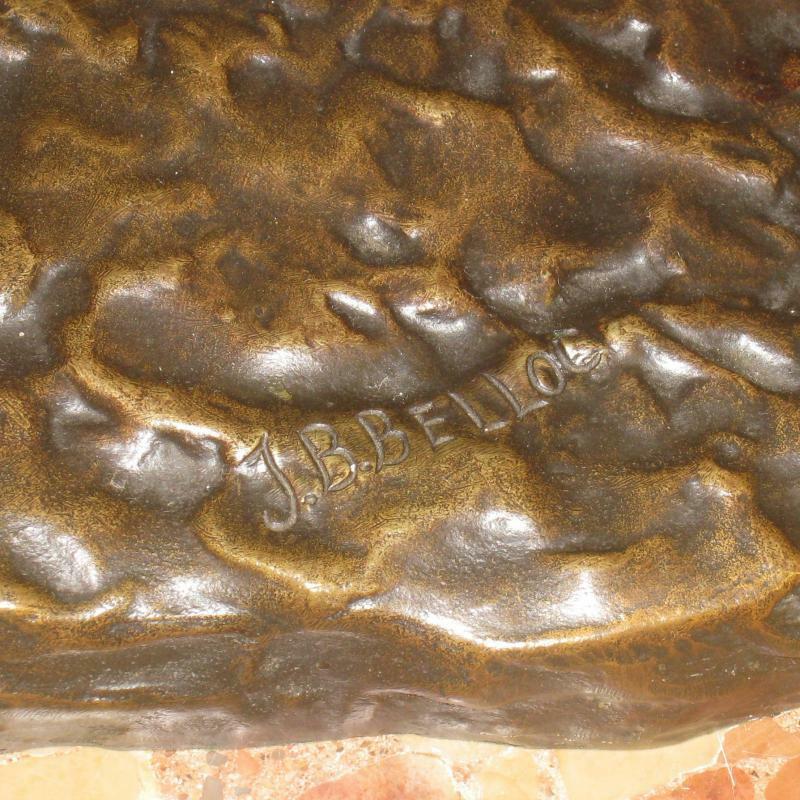 His works were cast by Barbedienne, Jollet et Cie, and Susse Foundry among others. The artist is included in Les Orientalists, Dictionnaire des Sculpteurs XIXe-XXe siecle, Les Editions De l'Amateur, ed. S. Richemond, 2008. The foundry operated at 26 Rue Amelot in Paris, on the avenue separating Le Marais from the 11th Arrondisement. Their showroom was located at 12 Avenue d'Antin in Paris.